I started sewing with my mother around age 10. By age 14 I was making complete outfits and entering them in local fairs and winning ribbons in the adult division. Shortly after that, Aunt Kate gave me a log cabin quilt kit. It was a great summer project and I loved finishing it, and so the love for quilts began. When I went off to college to study art, I found a passion for silk screen printing. Upon entering my second and third course, I asked the professor if I could do the assigned projects printed on fabric, in which he was intrigued by the request and said yes. For my final project, I printed a design on fabric and made a quilt from it. Mind you, it was a very crude form of machine quilting in the early 1980’s to today’s standards. Nevertheless, I received an A in the class. In the mid 90’s a good friend started quilting and that really inspired me to start quilting as well. And so it began…She went the machine quilting route and I was more interested in hand quilting at the time. It was hard finding a quality quilt hoop until I went on a fabric trip to Lancaster. I saw a sturdy square quilt hoop at a shop and didn’t buy it. What was I thinking?! When I got home I was kicking myself for not purchasing it. After about a month of searching for this hoop I found the company that sold them. They only sold wholesale. I asked them how many I needed to buy if I got my tax number and they said a dozen. I thought, there must be others looking for these hoops. So I obtained a tax number and sold a few hoops to friends, then had the rest sold on eBay within two weeks! Wow, there were others looking for a quality hoop. I found that most quilt shops put all their money into fabric and had little left for hoops, stencils, wholecloth quilts, notions and quilters gifts. 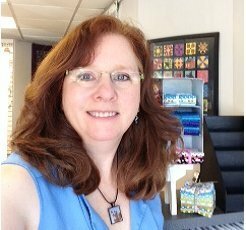 I soon started a web site and sold quilting supplies at quilt shows, working my way up to the Chicago International Quilt Show and AQS Shows, including Paducah. In 2009 my husband and I purchased a building in Union City, PA and I expanded Bee Happy Quilting to a brick and mortar store. We now carry quality fabric. When purchasing fabric for the store I came to a conclusion. Most quilters are sitting on huge stashes of fabric. So they will need one of two things, a blender to go with something they already have or a backing to match a top. Bee Happy Quilting offers quality fabric at a great discount price along with the best in quilting supplies and gifts.